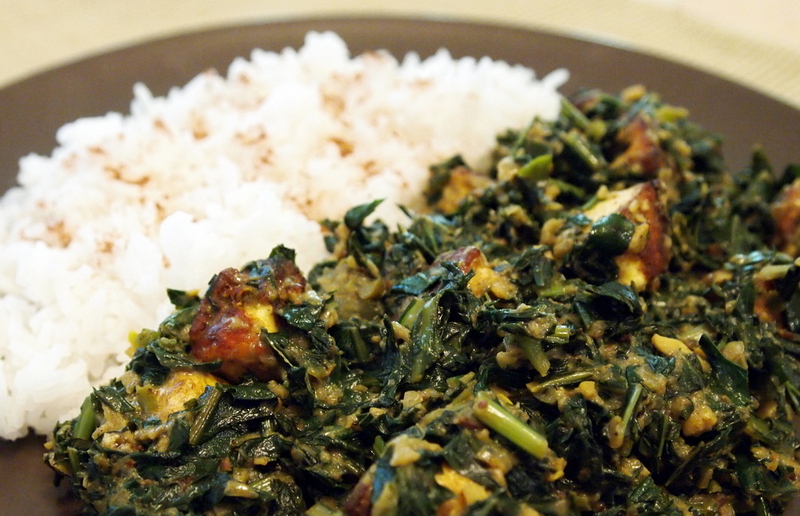 Get a good dose of your summer greens with this hearty curry! If you don’t have sweet potato and dandelion greens (often available during the summer at your local farmers’ market), you can substitute spinach, kale, chard, or nearly any other kind of greens in their place. Paneer is an Indian fresh cheese. You can also substitute widely available dense, un-aged Hispanic fresh cheeses that may be sold under a variety of names including, but not limited to, queso fresco, queso blanco, or panela. However, for the best results, we suggest making your own fresh cheese at home! First, you need to prepare your fresh spices for the curry. Using a mortar and pestle or a clean coffee grinder, grind the whole cumin, coriander, and mustard seed into a powder. Set aside. Use a food processor to finely chop the onion, ginger, garlic, and serranos down to a near paste-like consistency. Set aside. Heat 2 tablespoons of oil over medium high heat. Once the oil is hot and moves freely in the pan, add the paneer cubes and fry. Turn the paneer cubes every 10 to 15 seconds or so to get all sides fried to a light golden brown. Remove the fried paneer from heat and set aside. Discard the excess oil. To prepare the curry, heat the remaining 2 tablespoons of oil on medium-high heat in a large, heavy pot (a wok or karahi works best). Add the ground spices and simmer in the oil for about 2 minutes until brown and fragrant. Add the processed onions, ginger, garlic and serranos and lower the heat to medium. Fry this mixture for 10-12 minutes. By the end of the 12 minutes, the onions should be browned and all the spices and fragrances should mellow and harmonize. Increase the heat to medium-high and add the sweet potato greens, dandelion greens, and water. After about 5 minutes the greens should have cooked down to about half their original volume. Reduce heat to medium and continue to cook for another 8 to 10 minutes until the greens are very soft. Add the fried paneer and garam masala, and cook for about 1 minute more to get the paneer warmed. Turn off the heat and stir in the yogurt. Serve with prepared rice and enjoy!